Yesterday I took advantage of the holiday weekend to take my first long ride of the summer. I've been riding a lot lately, but it's all in the form of my daily commute between Mountain View and Almaden. I don't seem to be able to make time for a long, all-day ride on the weekends anymore, but on a long weekend I can normally fit one in. This weekend is Independence Day, so it fits the bill. I didn't really have a plan, but since it's been so long since I've seen Santa Cruz I decided to head down that way. On a day destined to be pretty hot I got an early start, rolling into the cool (but definitely not cold) morning at 7:30. 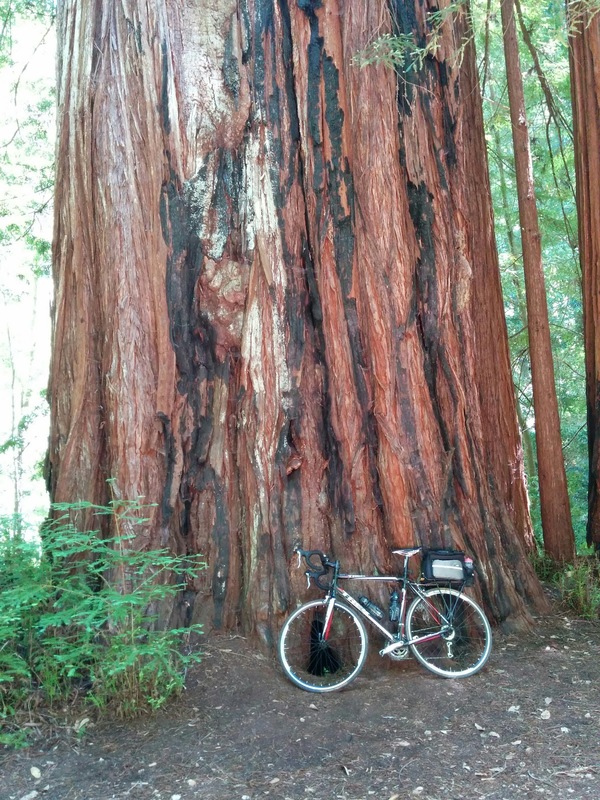 I took my normal route over Kennedy to the Old Santa Cruz Highway, rolling through the redwoods on a cloudy morning. 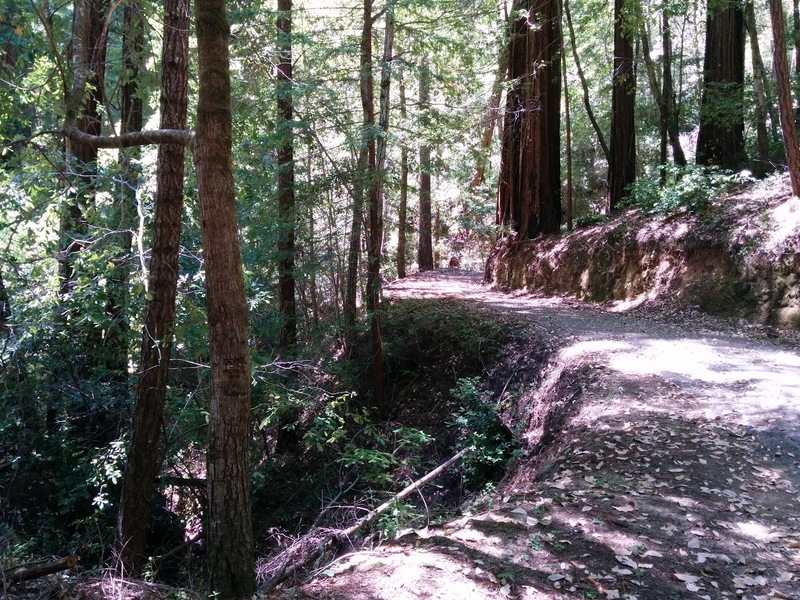 After a quick descent on a quiet San Jose-Soquel road, I took the turn onto Laurel Glen Road to enjoy the woods a little more. At the northern edge of that road I decided to take Rodeo Gulch Road, which was new to me, toward Santa Cruz. It turns out to be a pretty little one-lane road. I meandered through town mostly aimlessly, except that I wanted to see the ocean before heading back into the hills. 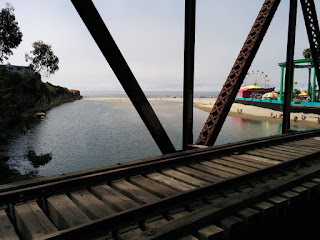 I ended up crossing the San Lorenzo on the old railroad bridge next to the Boardwalk, as I often do. The river trail took me to Graham Hill Road, which in turn took me to Felton. Graham Hill was busy with traffic and steep, but the sun was tamed by clouds and I continued to feel great. At Felton I turned on to Route 9, and continued north to Boulder Creek. I detoured onto Glen Arbor Road to try another road new to me, not to mention get away from traffic, but it seemed like there were a lot of cars there, too. 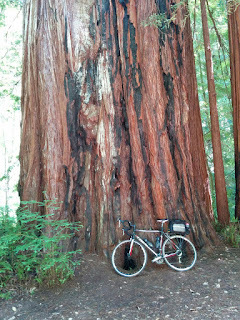 A redwood along North Escape Road. After lunch at the friendly Foster's Freeze I headed toward Big Basin State Park, this time taking Park Avenue to avoid a traffic a little more. As I continued on 236, the clearing skies allowed the sun to beat down and the effort on the climb began to tell. My morning of pleasurable cruising was becoming an afternoon of work. The park headquarters was crowded, and an overflowing parking lot meant that the road was clogged. I topped off my water and rested a bit, then headed off on North Escape Road for a little peace in the shady forest. One of the advantages of North Escape Road is that you don't have to contend with the traffic on the skinny side of 236, but on this trip I actually encountered my first-ever traffic on the upper part of North Escape Road, in the form of a park ranger heading the other way. 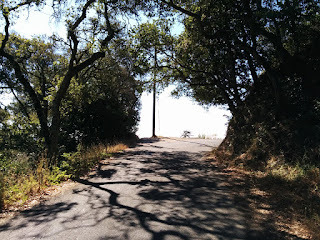 Once I got back on 236 I was exposed to the sun for the rest of the climb, but enjoyed the brief relief offered by the shade of occasional trees. As I continued up Route 9 I was calculating whether this ride would end up being 100 miles. Calculations done on the bike are always comically difficult. I suffered up the climb, but enjoyed the descent. I went back home the usual way, following part of my daily commute, and went home a slightly circuitous way to go over 100 miles. Yesterday's ride was just over 100 miles, with 8100 feet of climbing. The most difficult kilometer, on this day of moderate climbs, was on the upper part of North Escape Road. I'm pretty exhausted today, but if these long rides are going to be rare, I suppose I ought to make them count.